A slow cooker outfitted with a USB port? A thermostat that sends you text messages? A deadbolt that recognizes the sound of your voice? These ideas may seem like some strange mixture of James Bond's spy gadgetry and June Cleaver's immaculate housekeeping, but smart home technology is here, and the best home automation systems are becoming affordable for even the average American homeowner. By marrying 21st-century computing interfaces to 20th-century appliances that have been keeping homes running for decades, manufacturers are making our lives more convenient, more secure and more intelligent. With a mere hand gesture or touch swipe, you have complete mastery over your home and your life. With that in mind, we've compiled a list of 2016's best home automation appliances (or gadgets) for your intelligent home design and security. 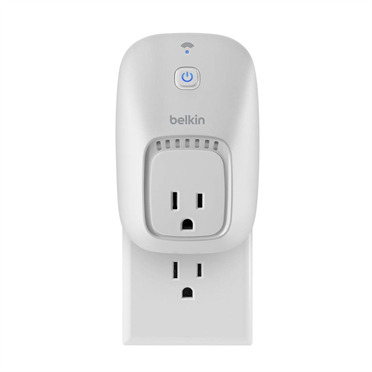 An update to the classic analog timer switch, Belkin's WeMo is a smartphone and tablet-compatible, Wi-Fi-enabled device with wireless activation, which allows you to turn anything plugged into it on or off from a remote location. You can also schedule electricity-saving "downtime" for your television, computer, lamps or other electric appliances using Belkin's free WeMo app (requires Android 4.0 or iOS version 5 or higher). You've gotten no more than two blocks from home, and all of a sudden you can't remember if you closed the garage door behind you. We've all experienced that moment of mingled panic and annoyance. Chamberlain's backwards-compatible MyQ allows you to monitor garage door activity via your smartphone. Not only can you now open and close your garage door remotely, but you can also elect to receive notifications whenever your garage door is activated ? or if someone (okay, you) forgot to close it. Unlike most smart locks, which require you to replace your door's entire handle and key mechanism, August's home security product is more of a retrofit. Simply swap out your existing deadbolt thumb turn with August's Apple-like, anodized aluminum-appearing and battery-powered hardware. 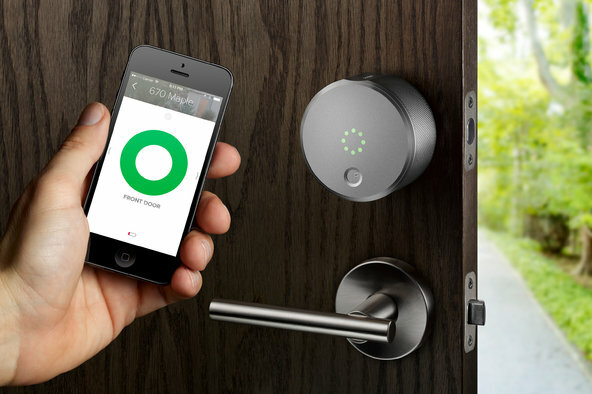 Using your smartphone's Bluetooth connection, the Smart Lock allows both you and authorized guests to open and secure your entryway, back door, etc. either using an "ekey"or an auto-lock feature. Never trouble with repeatedly pressing tiny buttons and diving through onboard menus to set and adjust a sprinkler schedule again. Blossom's indoor or outdoor-mountable device uses actual meteorological data to ensure that your lawn receives the exact amount of watering it needs. Using your smartphone or tablet, you can even customize schedules per zone - an especially handy feature for those with large yards and gardens or who care for a variety of decorative plants and shrubs. With this introduction to Osram's scalable indoor and outdoor lighting system, you receive a "tunable"LED wifi light bulb and gateway that allows you to monitor and control up to 50 compatible bulbs within range by means of a free mobile app. This advanced home automation device, allow you to Turn lights on and off, schedule brightening and dimming cycles, or adjust mood and ambiance in response to natural light conditions whether at home or away. Like something of an amplifier for your existing smoke and carbon monoxide detectors, the Smart Alert's heat, humidity and ambient light sensors and microphone are sensitive up to 75 feet. Once connected, Smart Alert can notify you of any potential fire danger via smartphone and allow you to dial 911 immediately. It can even alert your emergency contacts should you fail or be unable to respond to the free app's alarm notifications. Combining a sophisticated motion detection system, a wide-angle HD camera, infrared LEDs for low-light situations and even cloud recording, Ring's smart device allows you to answer your front door in real time from virtually any location. As with all of the other products showcased thus far, you'll need a working Wi-Fi connection and a smartphone that can run Ring's free app. Avoid a plumbing catastrophe with this simple yet ingenious system. The Insteon Sensor is a wireless, battery-powered box you place on the floor in areas where you might be concerned about water leaks, like around dishwashers, under sinks and near water heaters. Should the metal contacts on the base of the sensor become wet, the unit can be set up to send a radio signal to the Low Voltage/Contact Closure Interface, or "Linc,"which in turn remotely activates the motorized shutoff valve. This valve can close within five seconds, potentially saving hundreds of dollars in water damage. Last year, iRobot introduced the Roomba 980, the first of their popular and nearly 15-year-old robot vacuums to feature touch and swipe management via smartphone. Set to appear in the United States later this year, Dyson's competing model will similarly allow homeowners to schedule cleanings, store cleaning preferences and monitor their vacuum's progress to make sure the vacuum hasn't gotten stuck under the bed or stalled out in some high-pile carpet. Of course, Dyson is touting the vacuum's innovative features as well, which include true 360� "vision,"cyclonic action, a compact but powerful digital pulse motor and continuous tank treads rather than conventional wheels. It's truly amazing what is possible with a touchscreen device. The automated and intelligent home can make so many aspects of your life easier. Do you have automated technology in your home? What are your favorite smart products?